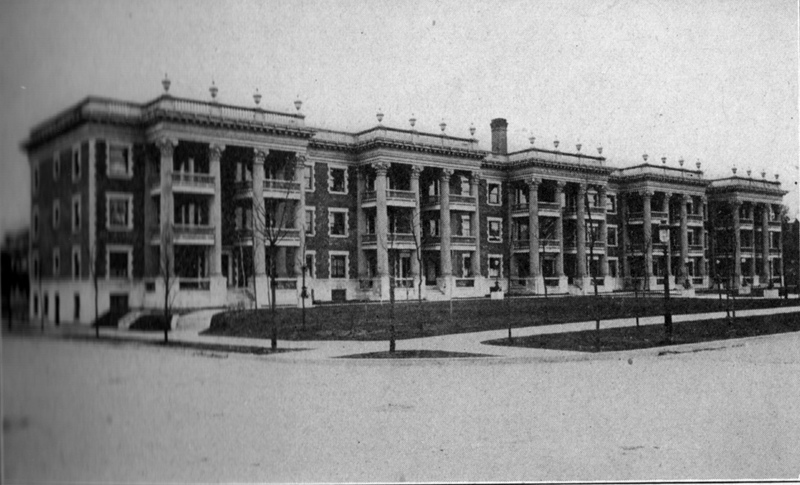 The Colonnade, which stretched along the south side of Armour from Central to Wyandotte, was one of the largest apartments in Kansas City when it was built in 1905. Builder W.H. Collins set a new standard for apartment design for the interior layout and the unusual deep front lawn. Photo from Pen and Sunlight Sketches of Greater Kansas City, 1911. Although his apartment building and small homes along Armour Boulevard no longer stand, W.H. Collins is remembered as a pioneer who left his mark on Midtown Kansas City. 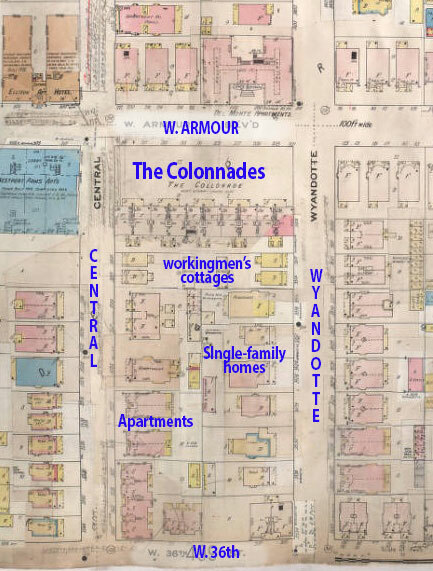 Collins’ structures once dominated the block from Armour Boulevard to 36th Street, from Central to Wyandotte, although neither his groundbreaking apartment building or workingmen’s cottages remain today. As part of our Uncovering History Project, the Midtown KC Post is taking a look at each block in Midtown, including a set of 1940 tax assessment photos which is available for many blocks. (Many people seem confused by the tax assessment photos, which all include a man holding a sign. Here’s the story behind them). This week, the block from Armour Boulevard to W. 36th Street, from Central to Wyandotte. 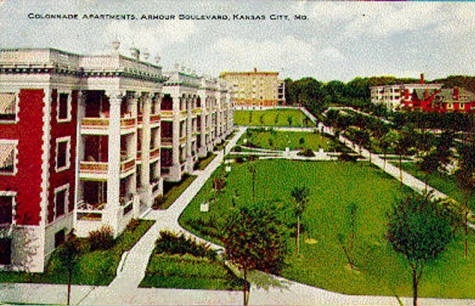 An early postcard showed off the Colonnade Apartments, highlighting their unusual wide front lawn and porches. In 1921, the Kansas City Star called W.H. Collins “a man who was not daunted by early misadventures in real estate.” He came to Kansas City with an interest in building houses, but arrived at the end of the real estate boom in the mid 1880s. After initial lack of success, he became the bookkeeper for the Kansas City Star until the market improved in the 1890s. Collins then began building fulltime, creating numerous small houses and apartment buildings across the city. A 1909-1950 Sanborn Fire Insurance map of the block. The Colonnade dominates the landscape. Collins also built four small cottages to as a buffer on the south side of the building. When it was built in 1905, Collins’ Colonnade was one of the largest apartments in Kansas City. It stretched the entire block from Central to Wyandotte, one continuous building. Each apartment had five rooms, with high beamed ceilings, two bedrooms and a maid’s room with rear entrance, and a front porch with a decorative railing. The builder also built four small cottages along the south side to keep other apartment buildings from being built too close. Collins also gave his name to a similar building, the Collinwood, on the south side of Linwood between Prospect and Wabash. The Colonnade stood until 1973, when the Commercial Union Assurance Companies tore it down and built an office building, currently occupied by the Red Cross. The cottages Collins built on the south end stood until 1976, when the Commercial Union Assurance Companies wanted the space for parking. For a while, their preservation became a cause for the Historic Kansas City Foundation, which tried to get out the word that the 60-year-old homes were historically important. Commercial Union agreed to give them to anyone who could haul them away within two weeks. Mrs. Suzanne Statland, a foundation board member, told the Star on Nov. 11, 1976 the houses were classic examples of workingmen’s cottages that dotted Kansas City’s residential areas in the first two decades of the century. The cottages on Wyandotte and Central in 1940. A search of newspapers that year shows no record of the houses being preserved. The slideshow below shows the other homes and apartment buildings on this block as they looked in 1940. It is so sad to see these wonderful colonnaded apartments gone, another example of bowing to developers short term thinking at the expense of the community and it’s long term future. This block is the where I call home; the 3500 block. The irony is the colonnaded buildings that yet exist along this street, one of which is mine, were designed to profile and frame our those grander edifices along Armour. Only two of the original beautiful homes still exist and are across the street from mine. Three others were torn down by the Red Cross, who had the misguided intent at one time to build a public pool in the assembled lots from Wyandotte to Central. Thank god that was stopped. That would have brought nothing but mayhem into this community. However, instead of that, one lot was then repurposed and now get to look at a lovely corrugated metal butler barn where one of the homes stood, which my neighbors and I refer to as the New Nelson, after the Nelson Adkins own lovely modern extension (sarchasm). The parking lot we stare out at now which sits exactly over the basements of the original Armour Colonnades diverts water directly east onto our street which now floods regularly, as it lacks proper drainage and has no asphalt breaks for trees or drainage absorption. Since the east side of the Wyandotte has now been restored beautifully, we can now only hope that someday we may get a conservation district overlayed within our own historic district so that this type of infill can never happen again. My home would be worth so much more had the rest of the original structures with their harmonizing aesthetic remained. If we get architecture that is transitional in style that uses materials, proportion and structure colors that are compatible with our current original buildings, such as what has been done in Union Hill, we will be made whole again. If we get buildings such as the building MAC properties is building just north of the Burger King at the intersection of Main and Armour, then my properties beauty, as well as it’s dollar value, will be diminished. If the 1960’s urban renewal architecture infill didn’t teach us then, I am afraid we will never learn.